There’s no immunity for the quick fire challenge tonight and Team Diva (Zac, Yigiti and Heather) are pretty excited about being on the same side for restaurant wars. To raise the stakes the winning team will get $30k! Quick Fire: For the relay the chefs had to mold 8 tart shells, pipe 8 buttercream roses, separate and beat 6 egg whites to stiff peaks (they have to turn the bowl upside down), roll strudel dough the length of the table and finally fill the dough with apples. It’s super close but Team Diva takes it and they celebrate like they just won the Super Bowl. The elimination challenge is Restaurant Wars – with desserts. 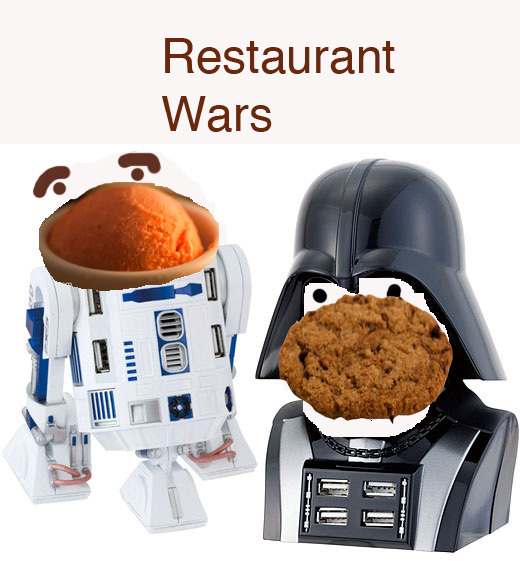 The two teams are Pastry Playland (Team Diva) vs. Whisk Me Away. Nancy Silverton from La Brea is the guest judge and she turns out to be very eloquent in her comments about the desserts. At the judges table – Hubert and Nancy Silverton joined Gail and Johnny. They heaped praise on Morgan’s dishes from the black team (Whisk me away). They had a few criticisms for Danielle and Eric’s desserts though. With Pastry Playland – they loved a few of Zac’s items and Yigit’s front of the house. They really had an issue with Yigit’s pie shells. They also really disliked the Playland for having an empty pastry case up front. They all took responsibility for the empty case. Morgan, Eric and Danielle’s “whisk me away” black team took the win along with the $30,000 (chocolate) clams. In the bottom three it was all of Team Diva: Heather, Zac and Yigit. The judges had issues with all three of them but it was Heather’s 3″ thick pastry shells that did her in. Heather was sent home. The Crying game: For the 7th episode in a row, there was crying on Top Chef : Just Desserts and this week we had multiple criers: Eric (for being on the winning team) Heather (for going home), Zac (for either Heather going home or being on the losing team). Fabio Viviani comments on the crying here. Notes: Note to Heather: telling Zac to “shut up” is not good karma. Zac’s one-liners are part of the show. For Fabio Viviani’s first take: Part I is here. Part II is here. Part III coming soon! For a recap of Top Chef: Just Desserts episode 6 go here.